Lady Gaga debuted a much fuller figure than she's sported in the past during an Amsterdam concert on Sept. 18. The "Poker Face" singer fought criticism about her skinny frame when she rocketed to stardom with her 2008 album, "The Fame" Gaga also lit a joint of marijuana during her show in the Dutch capital. LADY Gaga has been forced to address her recent weight gain after cruel taunts that she had piled on the pounds. The 26-year-old singer has admitted she has put on over ten kilos in recent months, but says her fuller figure isn't bothering her at all. “I’m dieting right now, because I gained, like, 25 pounds (11.3kg),” Gaga told radio host Elvis Duran. The singer's figure was criticised when she started her new tour in Amsterdam, leading some critics, including fashion commentator Kelly Osbourne to suggest she may be pregnant. But the 26-year-old says she isn't with child, but rather her Iove of her dad's Italian cooking is to blame. “I love eating pasta and pizza,” she said. “I’m a New York Italian girl. That’s why I have been staying out of New York. My father [Joe Germanotta] opened a restaurant. It's so amazing … it’s so freaking delicious, but I’m telling you I gain five pounds every time I go in there. 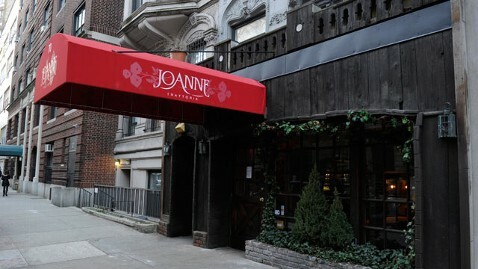 Joanne is owned by Lady Gaga’s parents and features a menu by Head Chef Art Smith, a dear friend of GiGi’s.